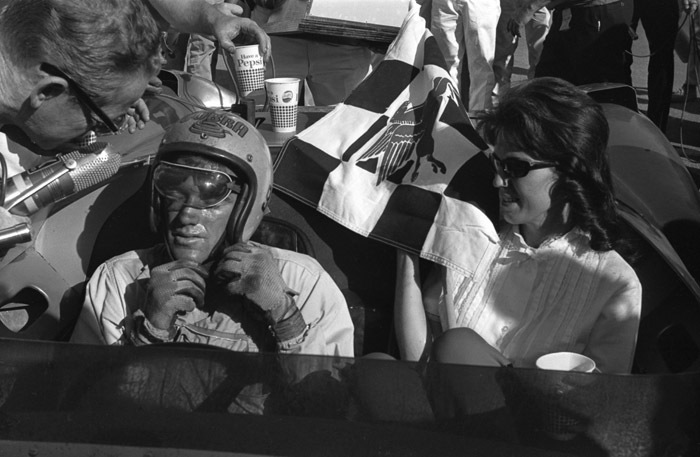 Victory Circle: Dave MacDonald and wife Sherry savor Dave’s big win at Riverside in 1963. We’re so pleased to have made contact with the late Dave MacDonald’s son, Rich. Dave MacDonald’s success while racing various Corvettes on the West Coast in the early ’60s caught the eye of Carroll Shelby when his Cobra project was in its infancy. Once a part of the Cobra team MacDonald was an instant winner, delighting crowds with his flamboyant driving style. We’ve sent books off for Rich MacDonald and Dave’s widow, Sherry. The great Dave MacDonald is prominently featured in the book. “Congratulations and thank you for producing a wonderful book, and showing some of the greatest times of auto racing. A terrific value, and certainly the best $64 that I have ever spent! !” Marshall B. “This book is exactly what I expected and is just a terrific compilation of the cars, people and California venues of that era. The text accompanying the photos is very well done. Thank you and congratulations on such a wonderful publication!” Ted W.